November 27, 2013 By Allyson 29 Comments This post may contain affiliate links. Read my disclosure policy. 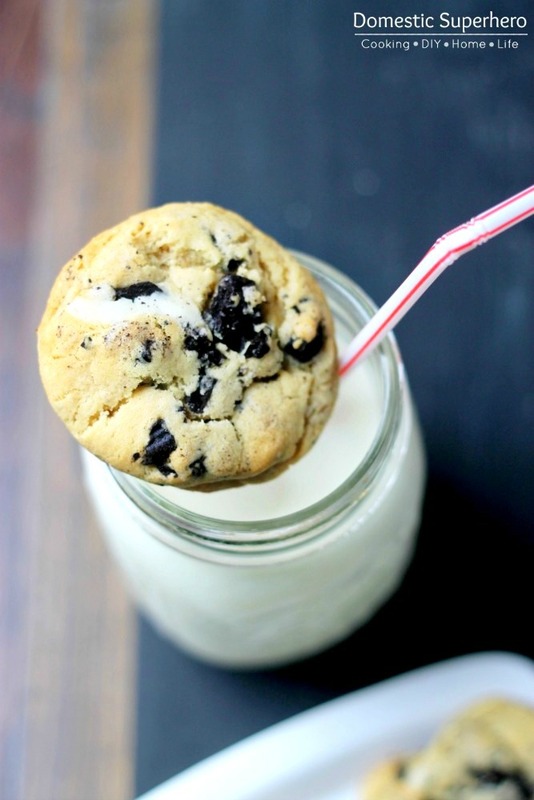 For the longest time I have been wanting to bake a cookie in a cookie…have you heard of that? I have seen recipes where they use Nutter Butters, inside of peanut butter cookies and whole Oreo’s inside of chocolate cookies. They all just look so cookie-licious. I decided to mix it up a bit and use Oreo’s for this cookie, and do a play on cookies n’ cream. The cream of the Oreo and the chunks of chocolate really balance out this simple sugar cookie base. 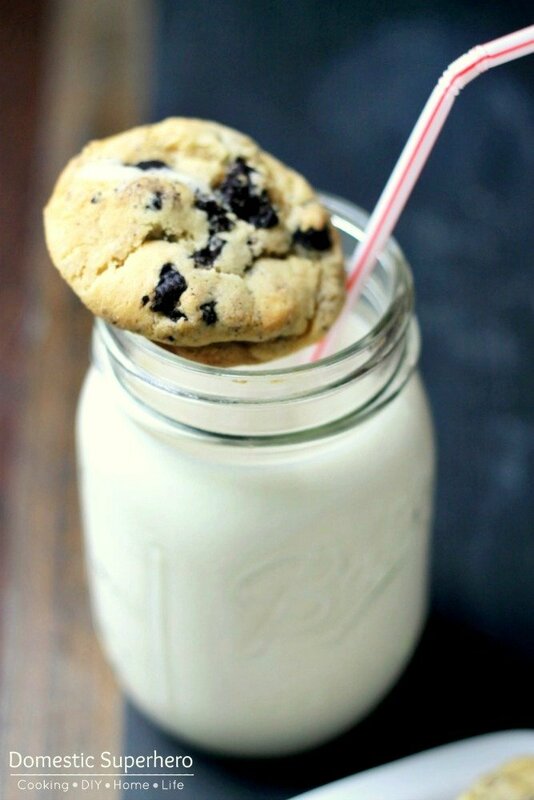 I have seen a few recipes out there that are similar, but add chocolate chips to the cookie as well. This would be delicious if you like super sweet cookies, but since I already planned to add the Oreo’s, I thought that would make it sweet enough. In my opinion I was right, but it all depends on your tastes! 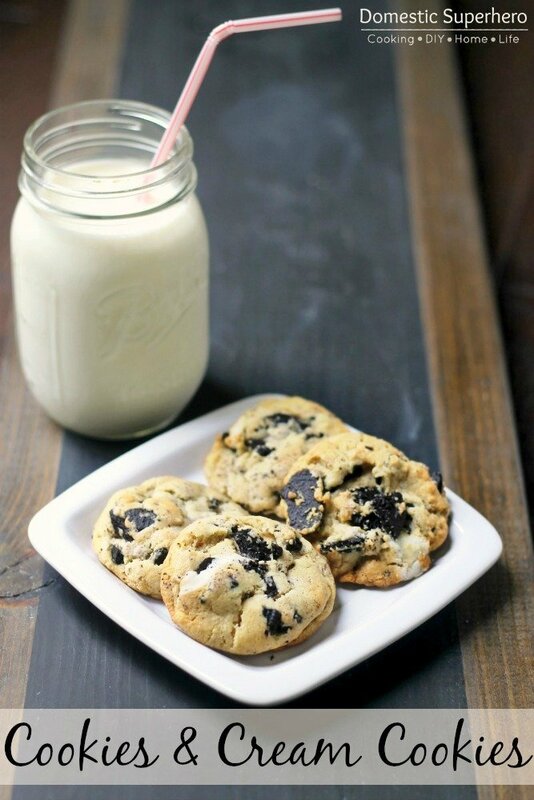 Feel free to add chocolate chips to this recipe for an even more sweet decadent cookie. 2. With a mixer, cream together the butter and sugars until light and fluffy, about 2 minutes. Add egg and vanilla and beat until well mixed. 3. In a medium bowl, whisk together flour, baking soda, and salt. With the mixer on low, slowly add the dry ingredients into wet ingredients until just combined. 4. With a wooden spoon or spatula, gently fold in Oreo pieces. 5. Scoop dough into small balls, and place onto an cookie sheet about 1-2″ apart. 6. Bake for 8-10 minutes or until the edges JUST start to brown (watch them!). Let cool on baking sheet for a few minutes, then transfer to a cooling rack to cool completely. You don't to over bake these and lose the 'cream' color. Make sure you watch the cookies from about the 6 minute mark on, until the edges are just slightly brown. Want more dessert recipes? See all of Domestic Superhero’s Dessert Recipes! « Keeping Stainless Steel Sparkling with Steel Meister and a Giveaway! Oh my goodness. These look amazing! I’m featuring them for my afternoon sweet tooth moment on Facebook today! about how many cookies does this recipe make?? Would love to know how many cookies this recipe makes. These look delicious! 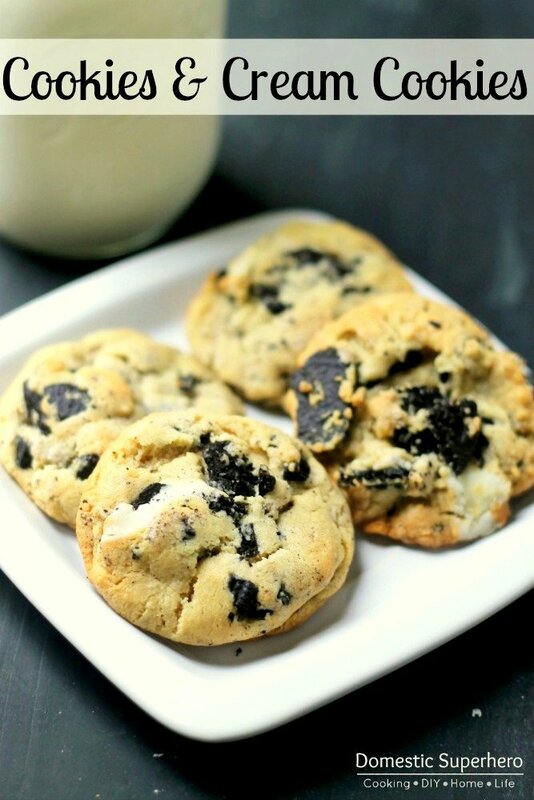 I’m crazy about Oreos and have never made another cookie using oreos before, can’t wait to make these! Yes!! You will LOVE them!